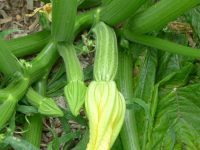 Here we go again…the zucchini are back! It is a summer ritual for me to complain about drowning in zucchini. This year they have arrived earlier than usual, so I suspect it is going to be a bumper crop. 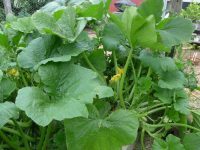 I have planted a ridged Italian variety this year which is firmer than other zucchini. They are also beautiful when cut, with a lovely star shape profile. As always, I have difficulty pulling up perfectly healthy plants so I have four of them. I am picking them every day. I will need to dream up a few new ways with the zucchini if I am not to end up hating them. So far they’ve gone into every stirfry, pasta and veggie roast I’ve done, but this is the first time this season I’ve featured them on their own. I started thinking about this dish as a salt and pepper batter kind of dish and decided on the gomasio as a way to add a slightly fishy taste to the zucchini with some seaweed flavour. They make a good beer snack. Mix ¼ cup corn flour, plain flour and the seasonings together. Add enough really cold water to make a thin batter. Put the ½ cup plain flour into a shallow dish. 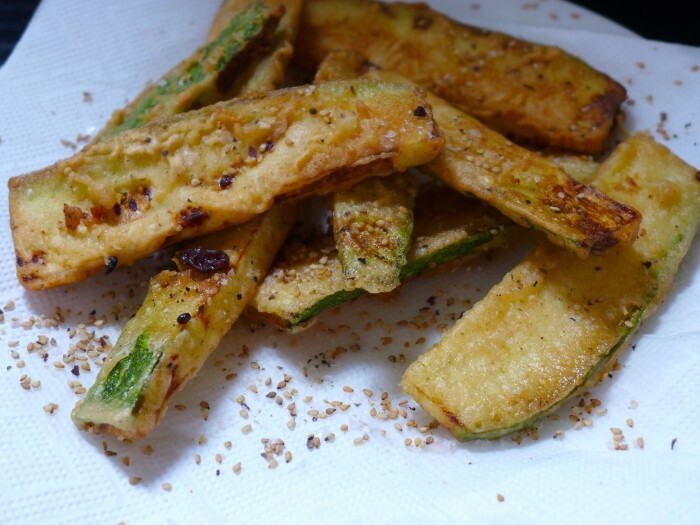 Dip the zucchini slices into the dry flour, then into the batter and drop into the oil. Don't overload the pan as the oil won't stay hot enough and the zucchini won't be crisp. Remove when golden and drain on paper. Sprinkle with gomasio and serve. It’s rare that I’m willing to wrangle batter and hot oil, but this looks totally worth it!